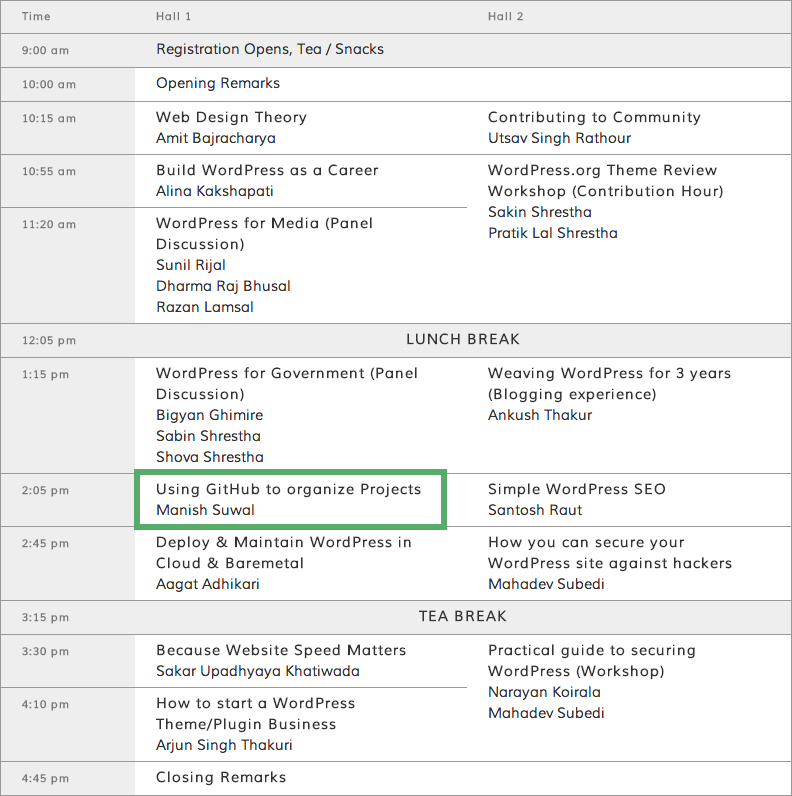 Last year during WordCamp Nepal 2013, I listened to almost all the speakers. 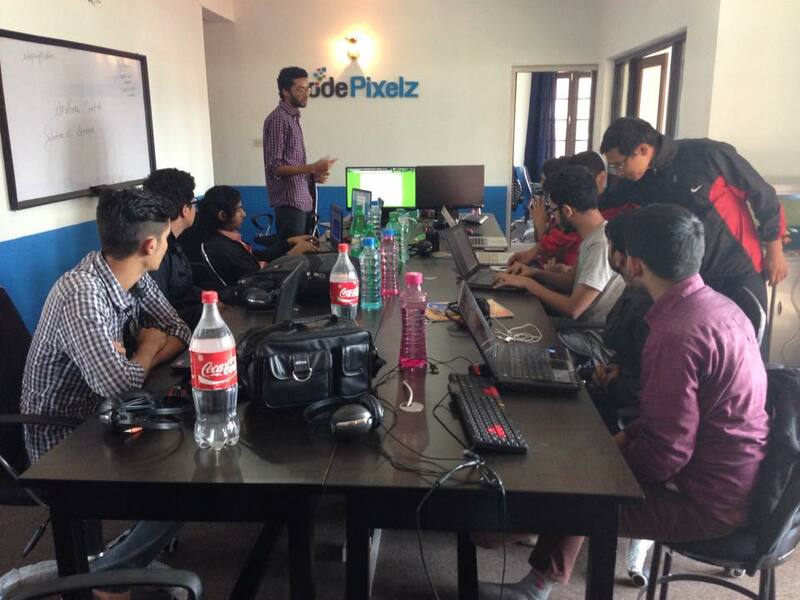 Some of them were pretty basic stuff for beginners, which made me realize that I could speak on WordCamp as well. I had a limiting belief that we should be an expert on WordPress to speak on WordCamp. By attending WordCamp 2013, I figured my belief was wrong. Of course, you need to have some knowledge on your topic before you speak, but you don’t need to be an advanced level programmer to speak on WordCamp. I realized that instead of being on the crowd, I could be on stage speaking. As I mentioned earlier, I didn’t have advanced knowledge on anything. 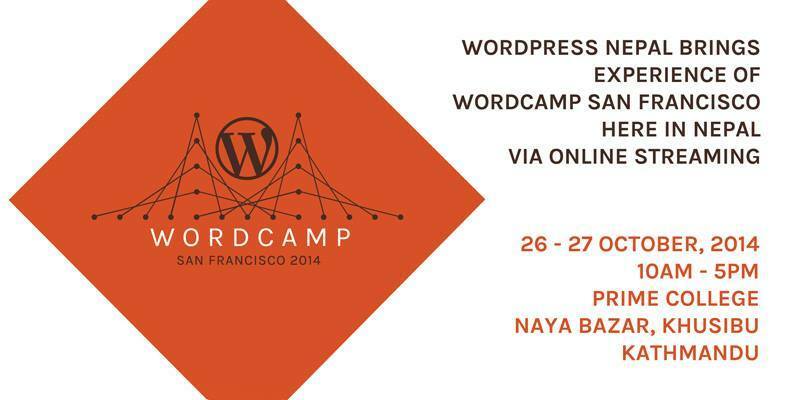 But since I saw speakers talking about basic stuff, I thought that I should give it a try and speak on WordCamp 2014. I had this in my mind when I left Yala Maya Kendra after WordCamp 2013. The basic idea is that difficulty level differs from person to person. Something that I feel difficult might be easy for you. And something that’s easy for me might be difficult for you. I even have a friend who finds it pretty difficult to post a new blog post using WordPress. With time, of course, it’ll be easier for him. But just posting a blog post is difficult for him at the beginning. So, you can’t know before hand what’s easy and what’s hard for a person. You can only think from your point of view, not from the other persons point of view. So anything that you’re finding it easy might be difficult to someone else. And they might be having problems on that specific topic. If you speak about it, those people will at least benefit from it. It had been about a year or so since that day – WordCamp 2013. I had already forgotten about wanting to speak on WordCamp because there are many things that I want to do, but don’t end up doing. I kept thinking this was the same thing. Something that I want to do, but eventually won’t end up doing. 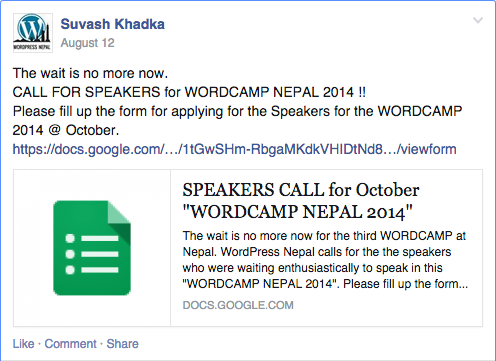 First on August 12, I saw a post an WordPress Nepal group that called for WordCamp speakers. I didn’t care about it because I was sure I wouldn’t speak. I only wanted to, but I thought I wouldn’t. I kept seeing new posts that called for speakers again and again during the course of the month, but I didn’t care to give it a second thought. At the end, there was a deadline. 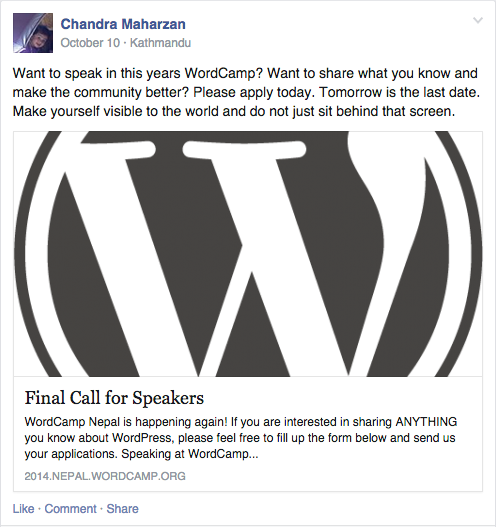 Just before the day of the deadline, Chandra Maharzan posted that it was last chance for anyone to sign up as a speaker for WordCamp 2014. I didn’t have any presentation topic, nor did I have any idea for it. Anyway I just thought of signing up. More than half of my body was detesting this idea, because I simply didn’t have any topic to speak about. And I was feeling very uncomfortable about the idea of speaking. While I was filling up the speaker form, it asked for the topic. I didn’t have any topic. I thought about it for sometime and figured out that I’m using git for version control, and that nobody had ever spoken about it before. And after a week, we were called for initial speaking session. I made slides just before the day of initial session and showed up. I thought it would be easy to just do the presentation. But I was dead wrong. I felt nervous just standing in front of around 10 people. And then my session went horrible. It was probably the worst session I ever had. I couldn’t speak. I was nervous. I got confused about the slides myself. We had WordCamp San Francisco live streaming party a week after that. I watched and learned how speakers speak during the WordCamp. I kept this thing in mind and so during the second session it went reasonably well even though there were only 5 of us. I again had some difficulty during the third session because I had changed many slides. I got some feedbacks on how I could improve those slides. Most of the feedbacks were based on keeping one point at one page, using visuals like pictures instead of words, and such. At this point I learned that feedback is very important. Without feedback, my slides would have been mediocre at best, and my presentation would have sucked. My slides didn’t have any pictures and had lots of points crammed in one page. I improved that. And during every practice session, I learned something new about how to speak and speaking in general. Usually if you focus on your body language, you forget to address the crowd. If you focus on your presentation too much without addressing the crowd, people will get uninterested, distracted and not pay attention to you and your presentation. So, feedback is very important. Without it, my presentation wouldn’t have not been up to the mark. I was pretty confident during the fourth session. It went well, even though everyone wasn’t paying attention. From that, I learned that we need to grab attention of the audience early during the initial session of the presentation. That’s the reason I kept my personal story on how I lost a client in the beginning of the slide so that people can relate to it and then it would helps in grabbing their attention. Just 2 days before the WordCamp, I was feeling sick. We also had a speaking session. I went and screwed up the presentation because I was feeling weak and couldn’t comprehend anything properly. It made me nervous for the real WordCamp speaking session. 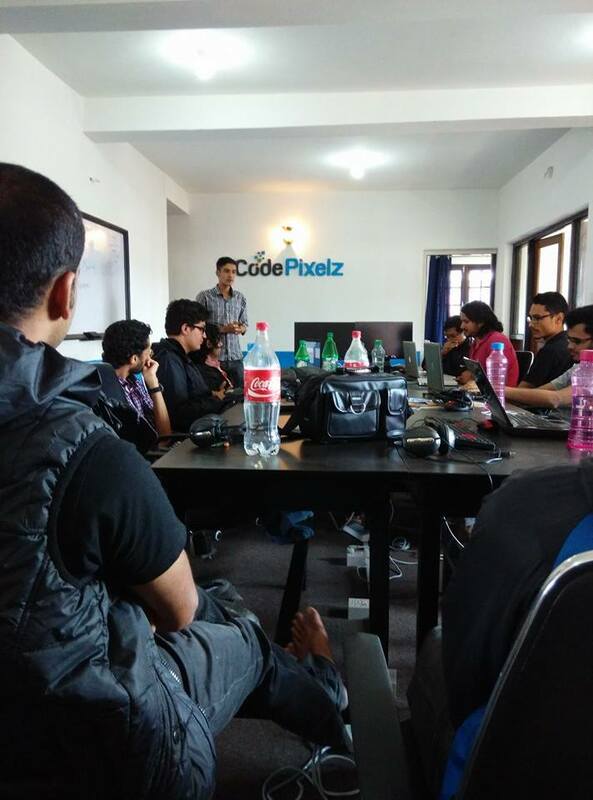 22nd November, Saturday, was the day of WordCamp Nepal 2014 #wcnp2014. I went there at around 9:30 and then met my fellow speakers. We had worked pretty hard for it. Not only the speakers, but volunteers, organizers and sponsors as well. My session was at 2:05 PM after lunch and the WordPress for government panel discussion round. I sat outside to practice one last time. It helped me a lot during the speaking session. My speaking session went reasonably well. Looking back, I give all the props to my previous speaking sessions and anyone who gave me feedback. I would have screwed this if it wasn’t for those practice speaking sessions. 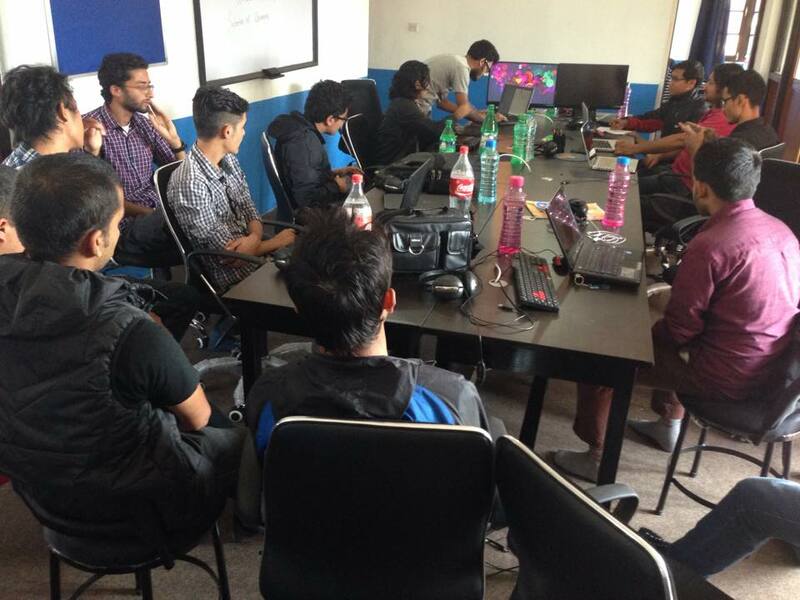 WordCamp Nepal 2014 as a speaker was incredibly awesome! Speaking on WordCamp requires a lot of work. We had to go through lots of sessions–around 5–in order to speak about our presentation comfortably in WordCamp. Maybe you won’t need that many sessions if you are used to speaking. However, it does require lots of dedication and persistence. 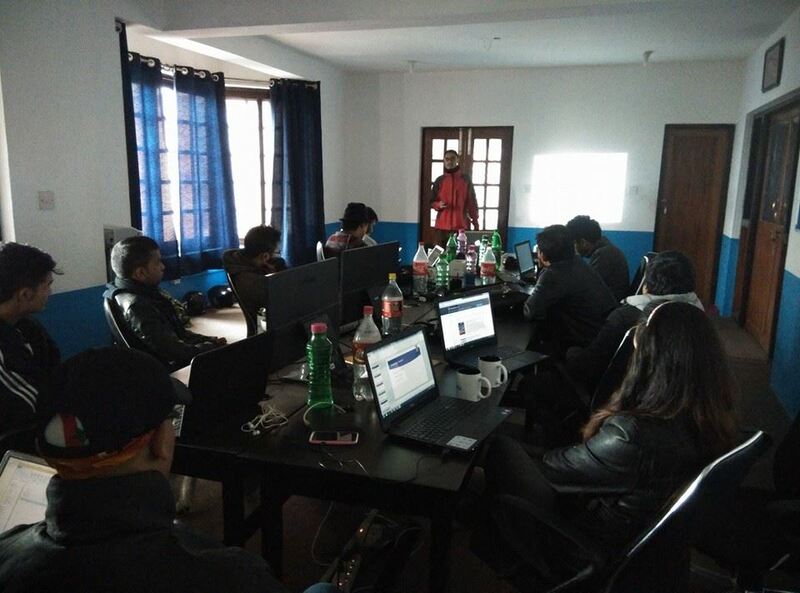 This was my WordCamp Nepal 2014 journey as a speaker. Just a day before the WordCamp, if I had privilege to choose whether to speak or not. I would have chose the option to not speak, because speaking in front of people is scary and uncomfortable. I would have simply stayed in my comfort zone. But there was no way of going back. My name was on the schedule. I had to do it. I couldn’t run out of it. There was simply no way out. So in whatever you do, not just speaking in WordCamp, but for other important stuff in your life, create a situation through which you cannot escape. Just like how I did it during the WordCamp. I signed up as a speaker, went to all the speaking sessions, had my name on the schedule, and then there was no escaping from it. If I had a last chance to escape, I probably would. Put yourself in a situation that just forces you. Where you just don’t have a choice. That whatever your emotions say, you have to do it. Like a gun pointed to the head. Either do or die. If you think you have a choice NOT to do it, you’re just never gonna do it. One thing is, one doesn’t need to be an expert to share knowledge. Sharing is as good when we know something of anything. Because that little something could be a new thing for someone else. 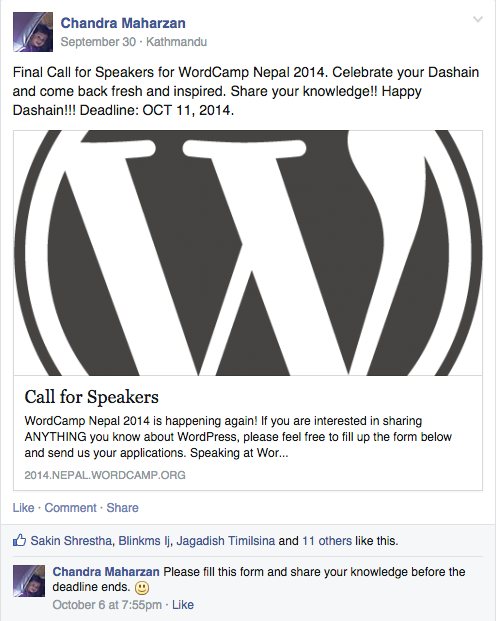 Any youtube video from WordCamp 2014 Nepal? 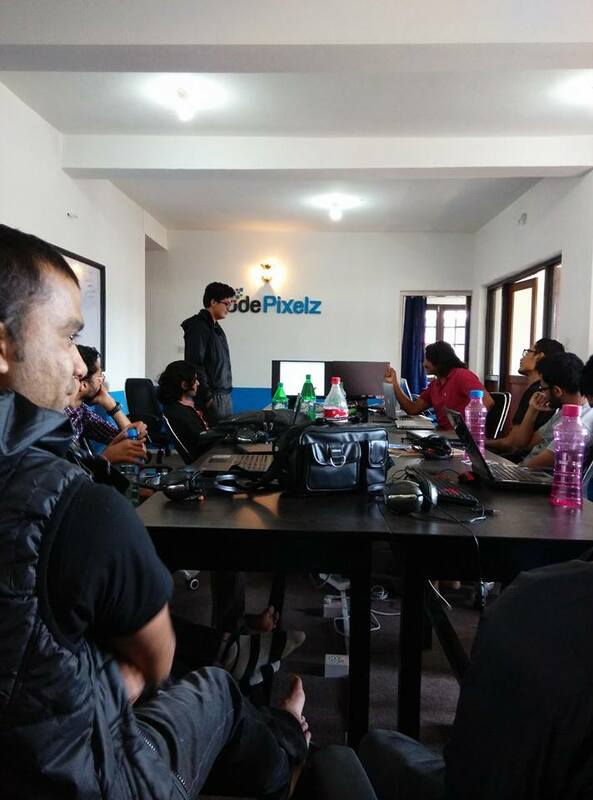 WordCamp Nepal 2014 was recorded. So, videos should be online soon. For sure you gonna be a rockstar speaker, Manish! I’d like to comment on earlier portion of your article. Everybody else is a speaker – the form varies – well, the form is audience level, knowledge shared and the platform of what the speech is about. For technical speeches like this, once you are well verse with the content matter – more precisely – what you work in, excel with – you are ready to stand ahead with the mic to throw your words onto the floor. I’m sure your experience of using GitHub and WordPress as professional helped you much in delivering and being a good speaker. Today is December 1, 2014. I just received a newsletter from Raam Dev on my inbox. It’s about his review of November. What happened during November and all the posts related to it. He also mentions that he’ll share everything during the end of the month. Interesting links, articles and book snippets. I figured that reviewing the past month and tracking helps a lot. I was thinking and looking for possible ways to review my month as well. Going through the archives, I figured that I’m already doing it. On the first day of every month, I write what I want to achieve during the course of the month. Instead of reviewing the previous month, I’m looking ahead. My main goal for November was to speak in WordCamp and prepare well for it. I spoke at WordCamp and it went well due to practice. Actually, right now while I’m writing this post, I stopped and went back to read it. I figured out that I’ve accomplished my November mission. Well, I can’t say I’ve accomplished it 100% because I didn’t record videos everyday. I only started preparing before some days of WordCamp. Even though I prepared late, I presented pretty well. Now, to look forward, I think I need to be serious. My biggest problem is energy level. I need to re-consider what food I put in my mouth and also not waste time on stupid mediocre stuff. When I first started posting blog posts, I used to send out email newsletter automatically whenever I’d post a new blog post. But since it was automated, I thought of sending manual email newsletters so that I could connect better with my subscribers. The biggest reason I’m not able to send out custom email newsletter is because I’m afraid that my subscribers will judge me based on my email updates. Not entirely judge, but I’m afraid that they’ll unsubscribe. I have lots of good stuff to offer, but I’m afraid that my mediocre posts will make them unsubscribe my blog and I won’t be able to make them aware of my new helpful blog posts. So, my biggest goal for this month is to make decision on how to send out email newsletters to my subscribers. Should I send out once a month with archives of all the posts. Or should I send out the old way by automating. Or should I send out every week after I have written new posts. I need to decide on one and stick with it. I also need to be serious on DevotePress now. I’m taking lots of screencasts. And I’ll continue doing so. Working on WordPress themes should also be a priority. Not sure, but for now I’ll write here that I’ll use underscores starter theme and modify it’s CSS so that I can collaborate to create a premium theme. It’s actually pretty late today. I’m writing this just because I don’t want to miss out on my monthly planner. If it wasn’t for this, I’d already be dozing off on my bed. That’s it for today, let’s see how this month unfolds.